Astronautics is the theory and practice of navigation beyond Earth's atmosphere. 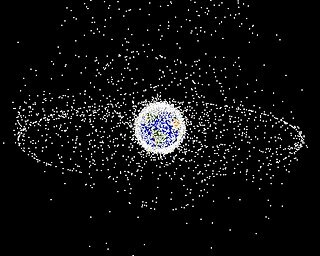 Initially, the term space debris referred to the natural debris found in the solar system: asteroids, comets, and meteoroids. However, with the 1979 beginning of the NASA Orbital Debris Program, the term also refers to the debris from the mass of defunct, artificially created objects in space, especially Earth orbit. These include old satellites and spent rocket stages, as well as the fragments from their disintegration and collisions. A single event upset (SEU) is a change of state caused by one single ionizing particle striking a sensitive node in a micro-electronic device, such as in a microprocessor, semiconductor memory, or power transistors. The state change is a result of the free charge created by ionization in or close to an important node of a logic element. The error in device output or operation caused as a result of the strike is called an SEU or a soft error. 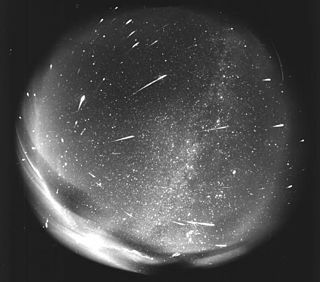 The Perseids are a prolific meteor shower associated with the comet Swift–Tuttle. The meteors are called the Perseids because the point from which they appear to hail lies in the constellation Perseus. Landsat 5 was a low Earth orbit satellite launched on March 1, 1984 to collect imagery of the surface of Earth. A continuation of the Landsat Program, Landsat 5 was jointly managed by the U.S. Geological Survey (USGS) and the National Aeronautics and Space Administration (NASA). Data from Landsat 5 was collected and distributed from the USGS's Center for Earth Resources Observation and Science (EROS). A substorm, sometimes referred to as a magnetospheric substorm or an auroral substorm, is a brief disturbance in the Earth's magnetosphere that causes energy to be released from the "tail" of the magnetosphere and injected into the high latitude ionosphere. Visually, a substorm is seen as a sudden brightening and increased movement of auroral arcs. Substorms were first described in qualitative terms by Kristian Birkeland which he called polar elementary storms. Sydney Chapman used the term substorm about 1960 which is now the standard term. The morphology of aurora during a substorm was first described by Syun-Ichi Akasofu in 1964 using data collected during the International Geophysical Year. The Space Weather Prediction Center (SWPC), named the Space Environment Center (SEC) until 2007, is a laboratory and service center of the US National Weather Service (NWS), part of the National Oceanic and Atmospheric Administration (NOAA), located in Boulder, Colorado. SWPC continually monitors and forecasts Earth's space environment, providing solar-terrestrial information. SWPC is the official source of space weather alerts and warnings for the United States. Space weather effects on Earth can include ionospheric storms, temporary decreases in ozone densities, disruption to radio communication, to GPS signals and submarine positioning. Some scientists also theorize links between sunspot activity and ice ages. The Leonids are a prolific meteor shower associated with the comet Tempel–Tuttle. The Leonids get their name from the location of their radiant in the constellation Leo: the meteors appear to radiate from that point in the sky. Their proper Greek name should be Leontids, but the word was initially constructed as a Greek/Latin hybrid and it has been used since. They peak in the month of November. A solar flare is a sudden flash of increased brightness on the Sun, usually observed near its surface and in close proximity to a sunspot group. Powerful flares are often, but not always, accompanied by a coronal mass ejection. Even the most powerful flares are barely detectable in the total solar irradiance. A Van Allen radiation belt is a zone of energetic charged particles, most of which originate from the solar wind, that are captured by and held around a planet by that planet's magnetic field. Earth has two such belts and sometimes others may be temporarily created. The discovery of the belts is credited to James Van Allen, and as a result, Earth's belts are known as the Van Allen belts. 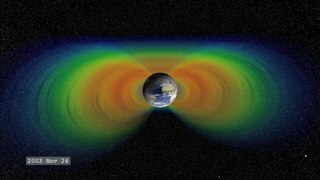 Earth's two main belts extend from an altitude of about 640 to 58,000 km above the surface in which region radiation levels vary. Most of the particles that form the belts are thought to come from solar wind and other particles by cosmic rays. By trapping the solar wind, the magnetic field deflects those energetic particles and protects the atmosphere from destruction. 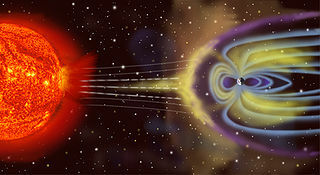 Space weather is a branch of space physics and aeronomy, or heliophysics, concerned with the time varying conditions within the Solar System, including the solar wind, emphasizing the space surrounding the Earth, including conditions in the magnetosphere, ionosphere, thermosphere, and exosphere. Space weather is distinct from but conceptually related to the terrestrial weather of the atmosphere of Earth. The term space weather was first used in the 1950s and came into common usage in the 1990s. Similar to terrestrial climatology, the long term patterns of space weather comprise space climate. A geomagnetic storm is a temporary disturbance of the Earth's magnetosphere caused by a solar wind shock wave and/or cloud of magnetic field that interacts with the Earth's magnetic field. 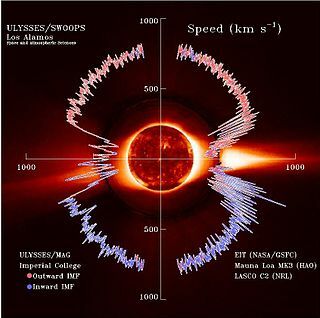 The increase in the solar wind pressure initially compresses the magnetosphere. The solar wind's magnetic field interacts with the Earth's magnetic field and transfers an increased energy into the magnetosphere. Both interactions cause an increase in plasma movement through the magnetosphere and an increase in electric current in the magnetosphere and ionosphere. The Van Allen Probes, formerly known as the Radiation Belt Storm Probes, are two robotic spacecraft being used to study the Van Allen radiation belts that surround Earth. NASA is conducting the Van Allen Probes mission as part of the Living With a Star program. Understanding the radiation belt environment and its variability has important practical applications in the areas of spacecraft operations, spacecraft system design, mission planning and astronaut safety. The probes were launched on 30 August 2012. Astronautical hygiene evaluates, and mitigates, hazards and health risks to those working in low-gravity environments. The discipline of astronautical hygiene includes such topics as the use and maintenance of life support systems, the risks of the extravehicular activity, the risks of exposure to chemicals or radiation, the characterization of hazards, human factor issues, and the development of risk management strategies. Astronautical hygiene works side by side with space medicine to ensure that astronauts are healthy and safe when working in space. The health threats from cosmic rays is the danger posed by galactic cosmic rays (GCR) and solar energetic particles to astronauts on interplanetary missions or any missions that venture through the Van-Allen Belts or outside the Earth's magnetosphere. They are one of the greatest barriers standing in the way of plans for interplanetary travel by crewed spacecraft, but space radiation health risks also occur for missions in low Earth orbit such as the International Space Station (ISS). A solar proton event (SPE), or "proton storm", occurs when particles emitted by the Sun become accelerated either close to the Sun during a flare or in interplanetary space by CME shocks. The events can include other nuclei such as helium ions and HZE ions. These particles cause multiple effects. They can penetrate the Earth's magnetic field and cause ionization in the ionosphere. The effect is similar to auroral events, except that protons rather than electrons are involved. Energetic protons are a significant radiation hazard to spacecraft and astronauts. Lagrange is a 2018 concept study for a solar weather mission by the European Space Agency (ESA). This is a British-led concept that envisions two spacecraft to be positioned at Lagrangian points L1 and L5. Explorer 50, also known as IMP-J or IMP-8, was a NASA satellite launched to study the magnetosphere. It was the eighth and last in a series of the Interplanetary Monitoring Platform. ↑ Here Come the Perseids!